Here’s a great article about our organic food donations that we can all feel great about. Thank you for making these and others donations possible! Bridges to Independence, which manages the Sullivan House Emergency Women’s Shelter in Arlington, published this great article about our longstanding partnership in their Newsletter this month. Click HERE to learn more about Bridges to Independence and the work they do in Arlington and Alexandria to help women and families. They are a great organization to consider for charitable giving. Farmer Kevin Brown grew up learning about giving back to the less fortunate. His family lived in Arlington, near Sullivan House – Bridges to Independence’s emergency shelter for homeless women and families – and he remembers bringing gifts to the shelter every year. “At Christmas, Mom would make cookies and we would bring them to the shelter. Then we learned to sew and we brought handmade dish towels and oven mitts. It was important to our parents that we learn about helping others,” he says. The lesson sure caught on! 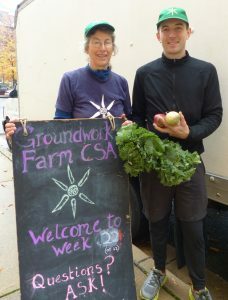 Today, Kevin is the owner of Groundworks Farm, an organic farm on Maryland’s Eastern Shore. The farm’s CSA (Community Supported Agriculture) provides fresh produce to Arlington residents year-round, including fruits, vegetables, eggs, chicken, meat and cheese. Customers pick up their shares each week; any shares not picked up are donated to local charities. Arlington shares are donated to Bridges to Independence, providing the shelter residents with a rare treat for those living in a shelter – fresh produce. Today Groundworks Farm donates 75 pounds of produce a week to Bridges to Independence, and recently the farm made its 100th donation! Bridges receives enough from Groundworks to provide each family in the shelter with a large bag of fresh fruits and vegetables every week, and often there is extra left over for other families in need. Shelter residents have access to small kitchens, so they are able to store and cook the donated food. Kevin’s mother Brooke Alexander delivers the produce each week, continuing the family’s connection to Bridges.